Byron Shire Council is to be allowed to determine the size lots and finer detail for the controversial West Byron rezoning for hundreds of new houses, after the state government decided this week to hand some planning power back to the local authority. But the sting in the tail is that the council will have just 60 days to finalise plans, leading Byron Residents Group to describe it as ‘a political tool in this election’. Planning department secretary Carolyn McNally has written to Byron shire’s general manager Ken Gainger agreeing with council’s recent request to delegate to council the finalising of the development control plan (DCP) for the West Byron Bay Urban Release Area. The department said in announcing its move that it had intended to hand back the powers since it made the contentious rezoning in November, but the announcement was only made today and council has only just been informed. The rezoning for up to 2,000 homes sparked community anger and protests, with many saying it will have detrimental environmental impacts on surrounding wetland and add to the current traffic congestion in the town. The department sent council a copy of the draft DCP ‘for it to work with’. Greens candidate for Ballina Tamara Smith welcomed the decision, saying the Greens have’ long campaigned for the return of planning powers to local councils ever since they were stripped away under Labor’s notorious part 3A laws’. Ms Smith said the move was ‘clearly in response to pressure from the community, but it goes no way to recognising the community opposition to this monster development that is out of character with Byron Bay’. ‘Hopefully this will see the end of the tiny 150-square-metre allotments and the imposition of more sensible planning conditions for the low-lying site,’ she said. ‘West Byron is not a “state significant site” and it’s time that the Nationals rescinded the rezoning decision and handed all planning powers for the site back to Council and the community to determine. Byron Shire mayor Simon Richardson also credited ‘community pressure for returning the situation to ‘normal practice’. ‘My understanding is that they may have only given the council 60 days to develop the DCP, which is incredibly short, and we don’t know yet whether that includes a public exhibition period,’ he told ABC radio this morning. Cr Richardson said that ‘reading the fine print’ it looked as though the planning department could take back the planning power if council was unable to come up with a suitable proposal within the time limit. He added that the letter from the department only arrived ‘a day or so ago’ and was short on specifics. Cate Coorey of Byron Residents’ Group described the announcement as ‘a small victory for the community’. ‘It is a sad indictment of the extent to which planning in NSW is determined by politics, not proper process and community input. It is clearly community pressure that has prompted this decision but why are they only listening to us now?’ Ms Coorey queried. ‘Planning should be an impartial process. ‘A government department should not be weighing in with a decision like this at election time Its intent is obvious given that the department was only last December trying to rush their version of the DCP through council. 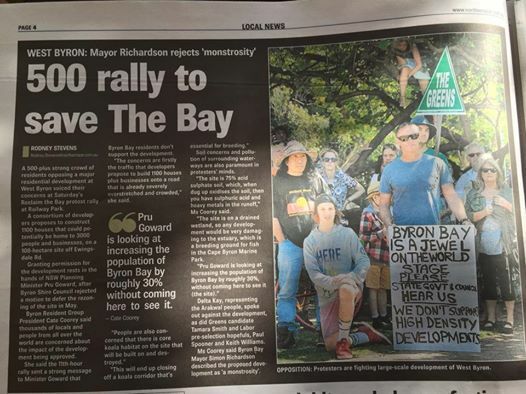 ‘Community voices are increasingly loud in rejecting the destruction of Byron Bay through the imposition of the sprawling West Byron mega-suburb. ‘Our rally last Sunday attracted over 1,000 people, we have had online petitions signed by thousands and collected hundreds more signatures on paper so finally the government has not been able to ignore us. ‘The point should be made that the rezoning of West Byron remains the same. ‘What changes is who says what can go on the site and Council is still constrained by the terms of the zoning, which allows lot sizes down to 150 sqm and provides no protection from most of the environmental laws that apply to the rest of Byron Shire,’ Ms Coorey said. But Byron Environmental and Conservation Organisation (BEACON) spokesman Dailan Pugh told Echonetdaily the announcement was totally misleading, in that council cannot alter the smaller contentious lot sizes as they were already in the West Byron SEPP. Mr Pugh said the lot sizes ‘have been established by the West Byron SEPP – the 150-square-metre lot sizes have already been incorporated into our LEP through the SEPP 83(3)’. ‘The DCP cannot alter this… also the claim that the department always intended to hand the DCP back to council is wrong, they never intended to let the council prepare, exhibit or determine the DCP,’ he said. Mr Pugh said the release also ‘conveys the false impression that we can alter the density without altering the DCP’. (iii) for the erection of a semi-detached dwelling—150 square metres. The New South Wales Government has approved the rezoning of land at West Byron Bay which will now allow a major housing development to go ahead despite strong community opposition. The Government says the development will ease housing affordablity issues in the region and generate up to 800 new jobs during construction. But the Byron Mayor, Simon Richardson, says the government is using housing affordability as an excuse to get away with inappropriate developments. He says only the rich will be able to afford the homes. “You are talking about a couple of kilometres out of Byron Bay, so certainly if you looked at the economics of it one would suggest that the houses would probably be at the high end of the scale,” he said. “So I do not think anybody would consider that affordable unless you are currently living in Sydney’s rich suburb of Woollahra, or Brighton in Melbourne,” said Mayor Richardson. “Local decisions should be made by local councils who know the issues and not by people in Sydney,”. Most Byron residents are opposed to the development and say it will ruin the environment and add to the town’s traffic problems. Cate Coorey, of the Byron Residents Group, says the government has completely ignored the community’s concerns and gone ahead with the project. The Group, which fought hard against the development, cited high-use koala habitat, acid sulphate soils, and traffic congestion, as major arguments against it. Ms Coorey warns that the community will react to the decision. “Byron residents are known to fight issues like this and we will continue to do so,”. Images from Sept 20 Rally can be found here……. Hundreds of residents have rallied in a show of opposition against the proposed West Byron Development this morning. Among them, Mayor Simon Richardson, who says the town deserves better than “80s urban sprawl”. ‘Unfair and unbalanced’ is how director of public affairs at the Department of Planning and Environment, Mathew Jones, described The Echo’s story last week on the lack of transparency in his department and its failure to release key documents relating to the proposed West Byron development. Yet despite repeated calls, we have not seen withheld documents from a freedom of information request, which was lodged by the Byron Residents Group. Those documents include reports or comments to the planning minister on the Belongil Estuary, acid sulphate soils and traffic management. The freedom of information refusal comes against a backdrop of ICAC findings against various NSW Liberal MPs, who received illegal funds from property developers. ‘The community reference group sought an extension to the exhibition period by two months; however an extended exhibition of nine weeks had already been provided to account for the holiday period and so this was not supported. A move by mayor Simon Richardson to ask the state government to defer rezoning West Byron again has failed to get support from a majority of fellow councillors. Instead, Byron Shire Council will request that concerns regarding one of Byron Bay’s largest ever urban developments be addressed to the minister’s ‘satisfaction’. The mayor’s concerns, which are echoed by the Byron Residents’ Association, are that traffic and acid sulfate soils studies are inadequate. They are asking for them to be more specific and comprehensive. Additionally, Cr Richardson asked that any decision be held off until the Byron Coast Comprehensive Koala Plan of Management (KPoM) and the soon-to-be-completed Local Growth Management Strategy (LGMS) is released. The mayor also called for a baseline assessment of the Belongil Creek and estuary to be completed. ‘1. The traffic study has followed RMS guidelines and reasonably considered all the likely impacts of the traffic generated by the proposed residential and commercial developments. ‘2. The Acid Sulphate Soils Study has been produced and considered in accordance with the Department of Planning’s Acid Sulphate Soils Planning Guidelines. ‘3. That all koala habitat on the site has been identified in accordance with SEPP44 procedures and that it will be protected from damage and disturbance. ‘4.That all other environmental and ecological aspects have been considered in the rezoning. During debate, the mayor said that the development is something that has waited ten years, and should wait a little longer. At that point, the full gallery murmured ’shame’, prompting Cr Ibrahim to say it was unacceptable for the gallery to interject. Cr Ibrahim then moved his amendment and spoke in favour of the development while also expressing concerns for due process and environmental protection. On a Thursday morning, it would be fair to say none. In Cr Richardson’s right of reply, he agreed the need for housing and jobs, but said that the, ‘Development Control Plan (DCP) is useless as the state government has gutted it; it only has to be considered. To put faith into that is staggering. ‘What is the difference between the Sunrise estate and this? West Byron is on lower ground, which will give more issues. It’s not the same. This is the last and worst bit of land to build on and the least appropriate place for such a development,’ he said. The Byron Residents Group, which held a meeting opposing the development on Wednesday night,says the altered motion ‘lacks the strength to achieve the community’s desired outcome’. ‘This amended motion doesn’t ask any hard questions of the department and gives the minister plenty of room to offer standard replies to questions being asked,’ group spokesperson Cate Coorey said. ‘Many of our supporters have already been getting these simple and dismissive replies from the department,’ she added. ‘The amendment removed from the mayor’s motion a request of the minister that the Growth Management Strategy be in place before a rezoning occurred. The strategy, which is a condition of the gazetted Far North Coast Regional Strategy, would allow the community to have a say in how and where development occurs in our area. ‘The amendment also removed the mayor’s request that the Byron Coastal Koala Plan of Management be in place before the rezoning is done as the proposed rezoning would allow for significant building in core koala habitat,’ Ms Coorey said. 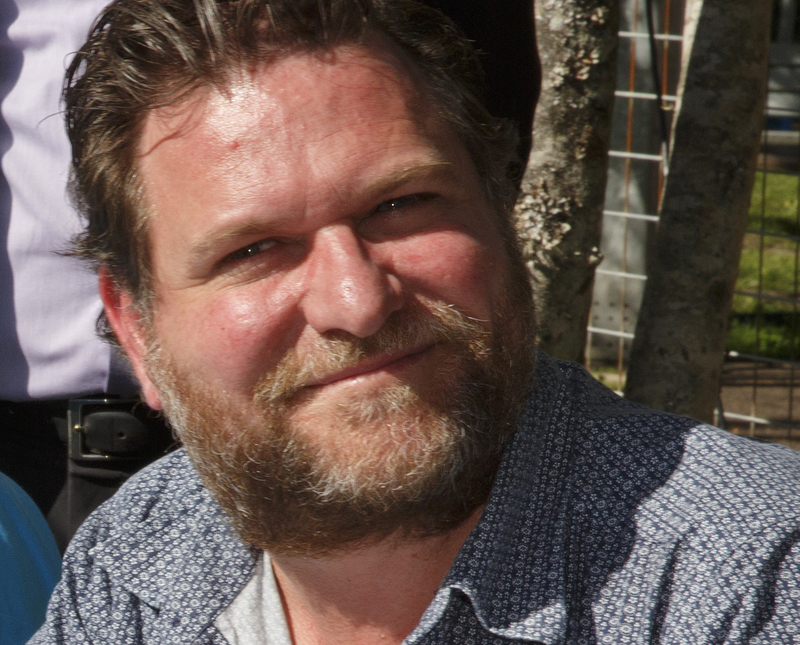 Byron Shire mayor Simon Richardson is hoping fellow councillors will support him in a bid to ask the state government to defer a decision on the controversial West Byron development. In a notice of motion due to be put at this Thursday’s council meeting, Cr Richardson notes ‘the deep concern of the broad community regarding the adequacy of the planning processes as part of the assessment of suitability for rezoning the West Byron Urban Release Area’ and calls for Council to ‘request the minister of planning [Pru Goward] to defer the assessment of suitability for rezoning the West Byron Urban Release Area’. The move follows an urgency motion on the same issue at last month’s meeting, which failed on the vote of fellow Greens Party councillor Rose Wanchap. The deferment would depend on a comprehensive traffic study ‘that follows RMS (formerly RTA) guidelines and accounts for the all impacts of the traffic generated by the full 1,100 homes and all the traffic generated by the proposed retail and light industrial businesses’. Cr Richardson also wants a ‘site-specific acid sulfate soils study’. Cr Richardson also wants to see the Byron Coast Comprehensive Koala Plan of Management (KPoM) and the Local Growth Management Strategy (LGMS) completed before the development site is considered for rezoning. Given past voting patterns it is unlikely the mayor will have the numbers to get his motion up. Of the nine-member council Crs Cubis, Hunter, Wanchap, Woods and Ibrahim are likely to vote against the motion. 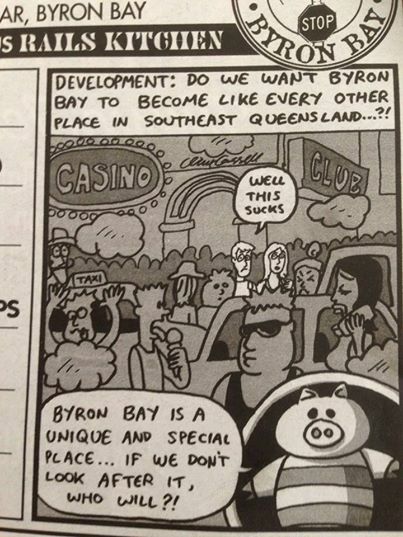 In related news the Byron Residents’ Group has called an urgent meeting to discuss the West Byron plans. The meeting will be held at the Byron Sport and Cultural Complex on Wednesday June 11 at 6.30pm. AN URGENCY motion calling on the State Government to defer rezoning of the 108ha West Byron Development was defeated at yesterday’s Byron Shire Council meeting. Councillors instead voted that the motion, put by Mayor Simon Richardson, was not urgent and would not be considered. 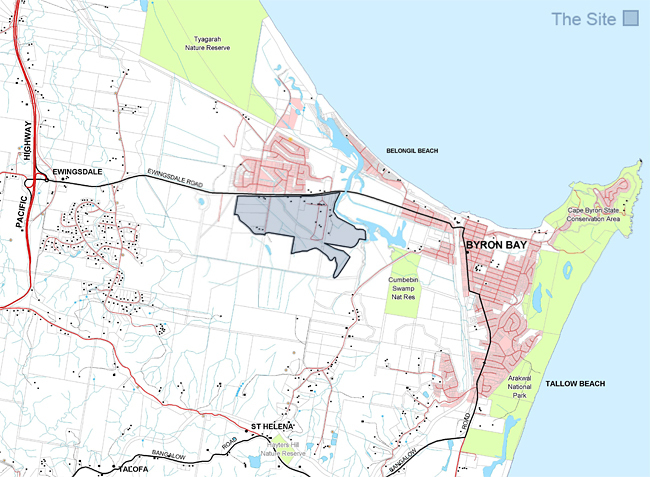 The motion would have asked the government to defer any decision regarding the land re-zoning until a comprehensive traffic study was undertaken, a site-specific acid sulphate soils study has been produced, the Byron Coast Comprehensive Koala Plan of Management is completed, as is both the Local Growth Management Strategy and a baseline assessment of the Belongil creek/estuary. Cr Richardson said he was particularly disappointed. 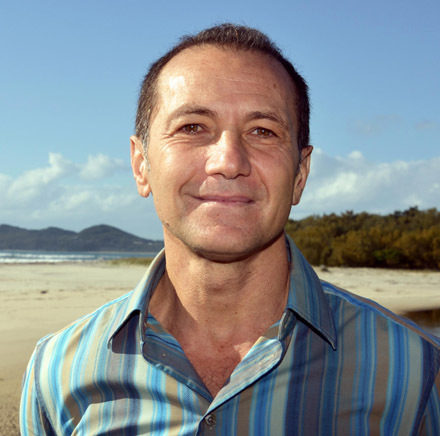 Byron Mayor Simon Richardson has failed to get a motion on the West Byron Development debated in council this morning. He’s wants the state government to give council greater planning power over the thousand-home development. Byron Greens Cr Rose Wanchap has crossed the floor on an urgency motion over the proposed West Byron development, siding with pro-development councillors against her own party to see the motion defeated. 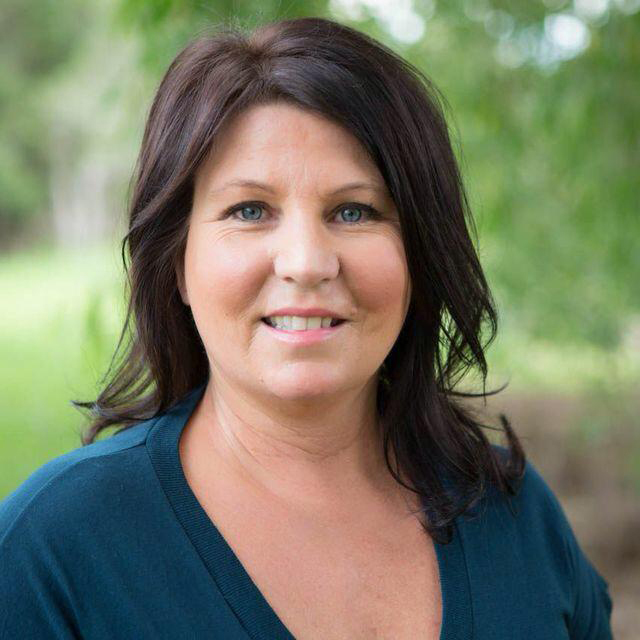 During public access time at yesterday’s Byron Shire Council meeting, two community group members questioned whether she had a conflict of interest and should remove herself from the vote. The renegade councillor and Byron Bay real estate agent was later tackled over the issue by a fellow Greens member outside the chamber. Mayor Simon Richardson’s motion followed intense lobbying from the Byron Residents’ Group and was considered ‘urgent’ as the department of planning and environment is likely to make its decision within the next few weeks. If approved, the planned estate of up to 1,100 dwellings in reclaimed wetlands would be the largest-ever development in Byron Shire. Echonetdaily understands the motion will be re-presented at next month’s meeting but not as an urgency motion. Tensions ran high during morning public access after the Byron Residents’ Group’s Cate Coorey and Philip Shine asked councillors whether, as a real estate agent, it was a conflict of interest that Cr Wanchap was voting on the development’s future. Cr Richardson called the question out of order owing to a recent change in policy, which sees questions not being accepted during public access. Mr Shine, from the Byron Residents’ Group, later told Echonetdaily, ‘We are not casting aspersions on whether Cr Wanchap has any conflicts of interests, but we wanted to know what the parameters are’. 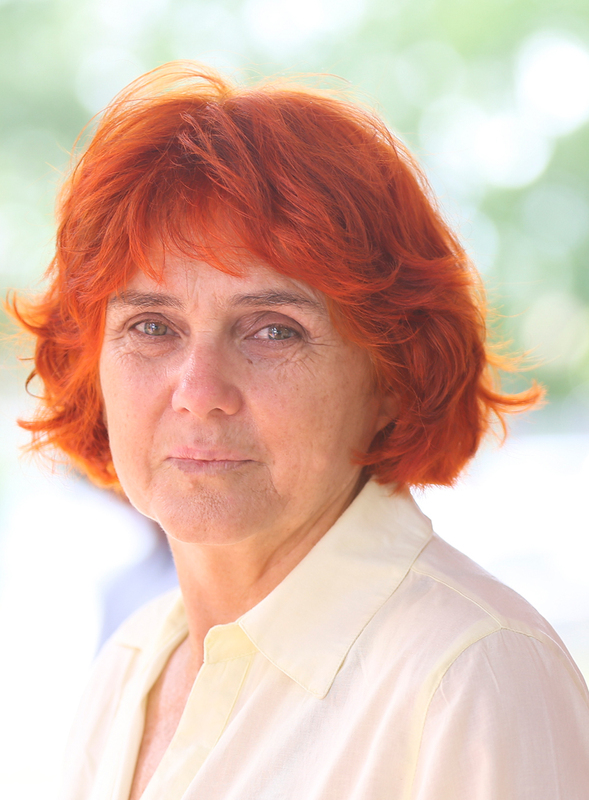 During a break following morning access, a squabble erupted after former Greens council candidate, Jim Beatson, accused Ms Wanchap of a conflict of interest – something she vehemently denied. National Party councillor Chris Cubis intervened and an argument ensued outside the chambers. During public access Byron Residents’ Group’s Cate Coorey made mention of 2,389 signatories to a petition asking local member Don Page to intervene and stop the rezoning. ‘Of those [signatories], more than half are from people in the 2481 or adjoining postcodes,’ she said. But those concerns were not shared by councillors, with Crs Alan Hunter, Chris Cubis, Di Woods, Sol Ibrahim and Rose Wanchap winning the vote against mayor Simon Richardson, Crs Duncan Dey and Basil Cameron. The Byron Residents Group has commended mayor Simon Richardson for bringing on an urgency motion at today’s council meeting urging the state government to knock back the controversial proposed development at West Byron. The future of the ‘state significant’ development is expected be decided by the government in coming weeks. Cr Richardson said he was not opposed to development per se but that ‘it’s all about scale’. In particular, she said the department had allowed studies referring to significant koala habitat and acid sulphate soils to be withheld from public exhibitions concerning the rezoning. ‘They have also allowed a traffic assessment to be included that is seriously flawed and does not follow Roads and Maritime Services guidelines,’ Ms Coorey said. ‘These irregularities have meant that the community was not properly informed as to potential negative impacts of the development so they could not make an unbiased assessment about the rezoning. ‘The department has not demanded an acid sulfate soil study be undertaken of the site which goes against its own guidelines for rezoning. Since 77 per cent of the site is acid sulphate soil affected, the potential for major damaging impacts on Belongil Estuary and adjoining Cape Byron Marine Park is very real. ‘The developers have grossly under-estimated the likely traffic impacts of West Byron. The Department of Planning and Infrastructure’s proposed zoning of West Byron allows for up to 1,100 houses rather than the 856 assumed in the developer’s traffic studies. ‘Byron Shire Council’s own 2009 traffic study assessed that the development of West Byron would result in a 12.6 per cent growth in traffic rather than the 8 per cent claimed by the developers. ‘An adequate independent assessment of the traffic impacts of West Byron upon which the minister for planning can approve this rezoning is yet to be done. ‘Given that core koala habitat has been identified on the site, it would be premature to allow rezoning until a proper assessment of the risk to koalas is conducted that conforms to Byron Council’s Draft Koala Plan Of Management which will come before council in July,’ Ms Coorey said. Byron Shire may need to take the State Government to court over West Byron (and other areas where the State Govt feels they can have a paternal role). I live in the Noosa Shire, and our Council has taken both the neighbouring Shire Council and the State Government to court over development issues. And the good news is – they won each time. Byron needs to stand up to the bullying tactics of its big brother – it’s not acceptable behaviour in either a person or a governing body.